April is here, and with it comes warmer weather and long days (just watch out for those April showers!) But possibly the best thing about April, is that we get to make jewellery featuring diamonds! Why? Because Diamond is the birthstone of April (you lucky April babies). We already had a great range of diamonds and some exciting new products have added to that range, making it even more tempting! We understand that working with Diamonds can be pretty daunting, but don't worry - we're here to show you what some of our previous customers have been up to. We always love getting some inspiration from the people who know best... You! By the end of this post, we hope you'll feel excited and ready to start making amazing diamond jewellery! 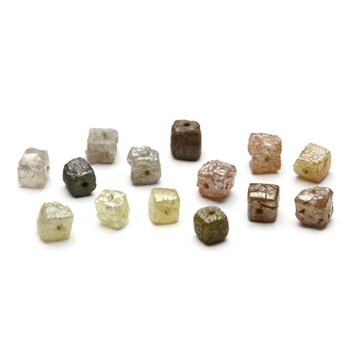 These beautiful natural diamond nugget beads are available in a range of subtle natural colours, one of the most popular is black, but we also have grey, champagne and green, click here to see the full selection. 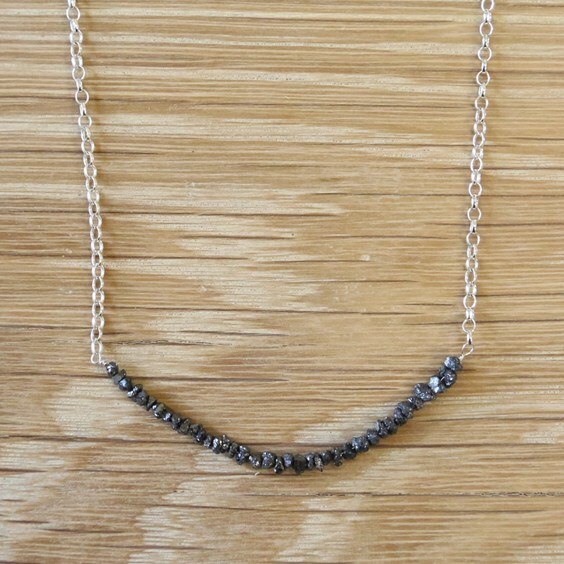 This gorgeous necklace was made by Caitlin Booth of jewellery brand When Caitie Met Soda. She has used our black diamond natural bugget beads to make this striking pendant. We love this design as it shows the versatility of the beads. We also stock these beads in silver and champagne. TIP: The holes in these beads are very small so try using a fine wire such as 0.2mm sterling silver wire. Rose cut diamonds are a really nice way to start introducing diamonds to your designs. If you are used to working with semi precious cabochons and have mastered bezel setting you will be able set these in the same way as they have a flat back and are a much less daunting prospect than setting a traditionally cut faceted diamond stone. You can make the bezel yourself using bezel wire. Rose cut diamonds are available in other colours too and would look wonderful together as stacking rings. 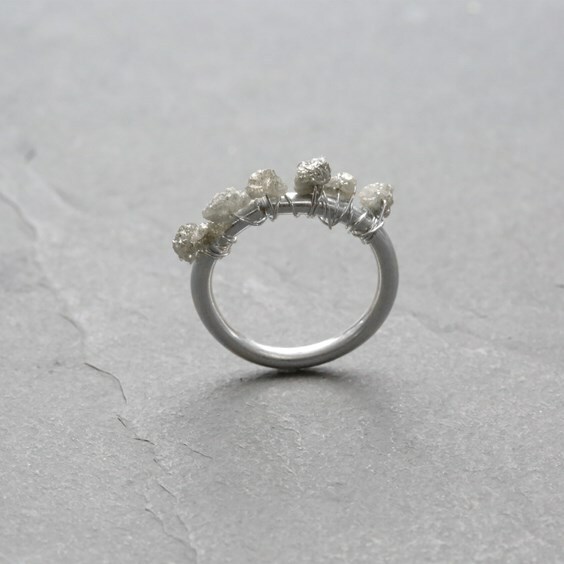 This beautiful ring was created by jeweller Kate Arnold who makes jewellery under her personalised jewellery brand Dino-Daisy. It see's a gorgeous yellow diamond set in the centre of a nest of granulated silver and gold balls. Kate emailed us pictures of her amazing design saying, "I took the plunge and ordered one of your yellow rose cut diamonds last week. I just wanted to pop a quick note to let you know I LOVE IT". "I was only meant to be ordering a donut bail... but couldn't resist!". These unique cufflinks are made by jeweller Caroline Jones. Caroline set our rose cut black diamonds in these sterling silver textured cufflinks which have been oxidised and polished back to enhance the design. Caroline left a great review of these diamonds saying, "I love the way they sparkle, but are understated. I was delighted with my purchase as they really made the cufflinks look special". They will certainly make for a very special gift. This wonderfully simple design looks incredible with its subtle finishing touches, such as the hammered effect band. It looks even better when it's stacked in its set, so make sure you have a look at the site! We love the contrast of the silver grey diamond rose cut cabochons with the gold metal. 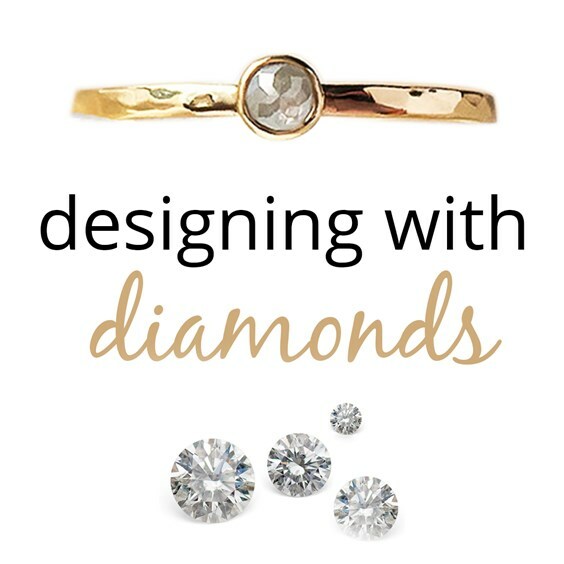 With a wide variety of Diamonds now available on our website, there are an array of design possibilities to get creative with! 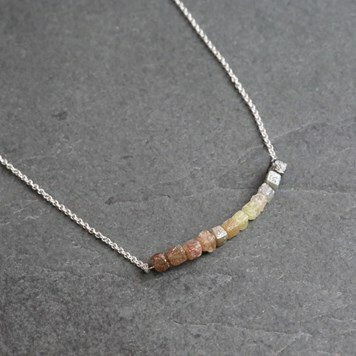 These rough diamonds are much larger than the nugget beads that are sold on a strand and allow you to buy them individually which is ideal if you want to make a feature out of one on a necklace. We think these would look great wrapped on wire and inserted into the middle of a chain necklace. This is a really easy technique and we have a step by step tutorial showing you the technique here. With two different qualities available (W24 for a super bright, clean & sparkly stone or W30 for a more affordable option) you can create with these classic diamonds to create jewellery within your budget. 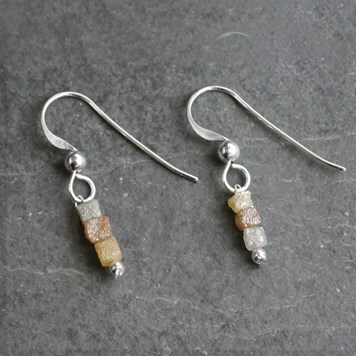 For a super easy make you could even set these in our ready made snaptite earring settings, so called as the stone simply snaps into place. To ensure a totally secure fit check the claws are holding the stone tight with a pusher before wearing. To learn more about diamonds, what they traditionally mean and plenty more inspiration, check out our blog post. Although we've featured loads of great products on this page, check out the entire diamond category, to see everything we have on offer and make yourself something beautiful today!